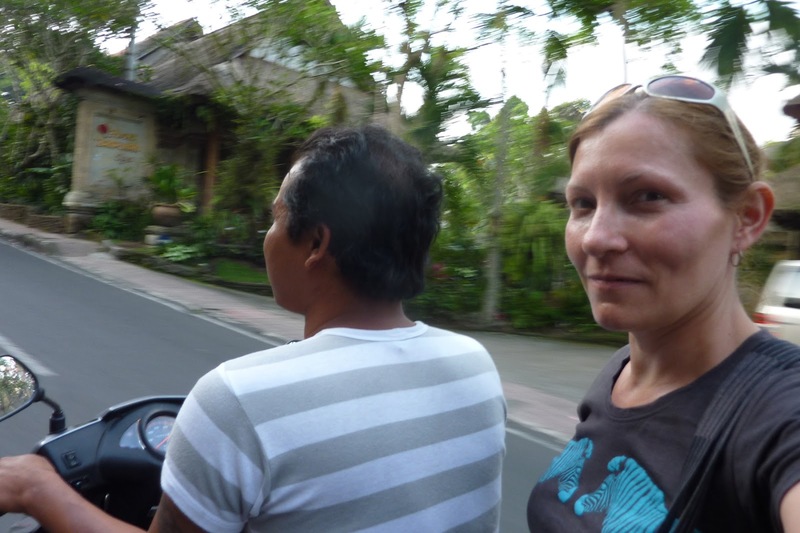 I woke up early, a bit dazed from my previous night out in Ubud, Bali. I’d gone to a bar to see a literary event—a reading by a writer I’d never heard of. I’d been surprised to learn he’d lived in Cairo around the same time I had (I’d been there making comic books), and we had a mutual friend who still lived there. I enjoyed seeing his slideshow and hearing the host interview his guest. The expat crowd here had turned out to be fierce, though. One of them took the speaker to task for saying there is a difference between the people of a country and their government (“because the people elect the government”), and another had made a speech about how the topic “What the Egyptian Revolution means to the West” wasn’t relevant to the primarily Australian audience. Tough crowd, I thought, ducking out early to hire Nyoman—my regular motor scooter taxi driver—to take me back up to my perch above the rice fields. This morning, I headed down the steep stone Campuhan Steps to the sidewalk into Ubud’s center again—on foot this time—to take a silver-jewelry-making course at a shop called Studio Perak. I’d signed up for the jewelry course after I’d hadn’t been able to get into a course on Balinese cooking. I’ll take pretty much any class—I find the learning process engages my mind in nearly the same way that travelling does. I am more engaged by novelty and challenge than by destinations and cultural events. So for me, arguing with Congolese customs officials or trying to work out how to get around an illegal roadblock is more fun than going to the beach or on a cruise. 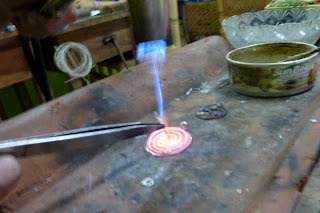 The workshop was in the back of a Studio Perak jewelry store on Jalan Hanoman. “Jalan” is a street or avenue or path, and “Hanoman” is the monkey god. 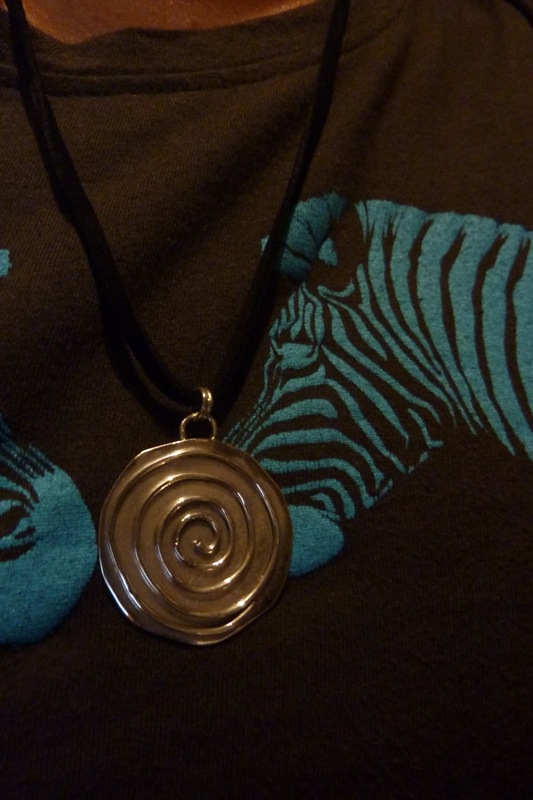 I stepped in, paid, waffled a bit as I looked at the options, then finally declared my intention to make a necklace. Sure! I can make a necklace, I thought. I’ve made wooden tables and sewn handbags and once tried knitting (I was terrible at it). Why not make a necklace? 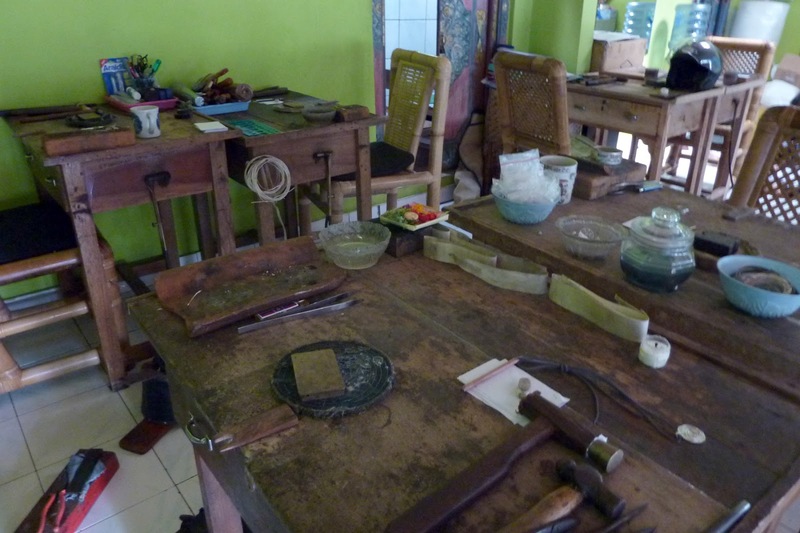 A Balinese silversmith took me and a mother-daughter team into the workshop. Step one was easy enough. We used plastic templates to draw circles on paper. “Now cut them out,” said our teacher. This much I could handle. 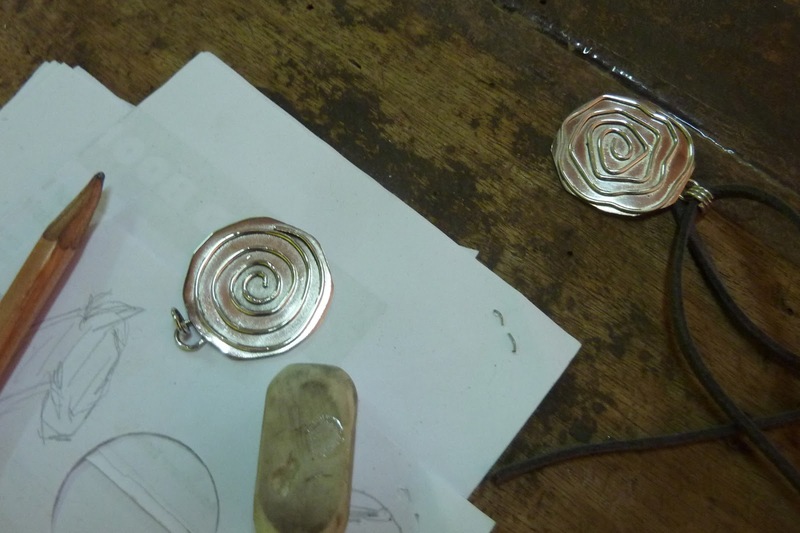 Step two was to hammer a sheet of silver flat. I wasn’t too bad at that either. Step three was to glue the paper circle to the sheet of silver, then cut it out with snips. Each step was getting a little tougher, and step four was a doozy. I used needle-nosed pliers to fashion silver wire into a shape. My original intent to do something resembling a zebra quickly became less ambitious. A spiral would do nicely. 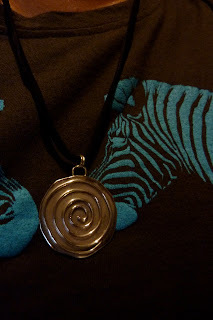 I twisted the wire and held it in place against the silver pendant I’d cut. “Do you want to write something on the back?” The teacher was standing above me. 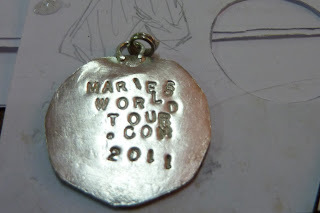 I used a hammer and some heavy stamps to smash the letters into the pendant. Too late I realized masking tape would have given me a steady horizontal line, but nothing could have tipped me off to stamp them right-side-up. If I'd known stamping MariesWorldTour.com on the back would mean I'd have to file the front flat for 20 minutes, I probably wouldn't have stamped at all. But I did appreciate the clumsy, makeshift lettering. It fit my travel style. So I filed and filed until the stamps were no longer visible in reverse on the front, then cut and bent a few more pieces of wire. The instructor soldered them on for me. I’m not bad at soldering myself, but I wasn't about to tell him that once I realized the soldering wasn't from an iron. It was from a pedal-operated blowtorch. And I had to pedal while he soldered. This was a two-person operation. Next I had to sand and polish the front for a long time. Then we placed the spiral on the front used the pedal-blowtorch again. I finally sat back and admired my messed-up project. Wow, that was not something I was likely to give away as a souvenir. “It’s worse than my handwriting, which is terrible,” I said. But I had enjoyed the process. 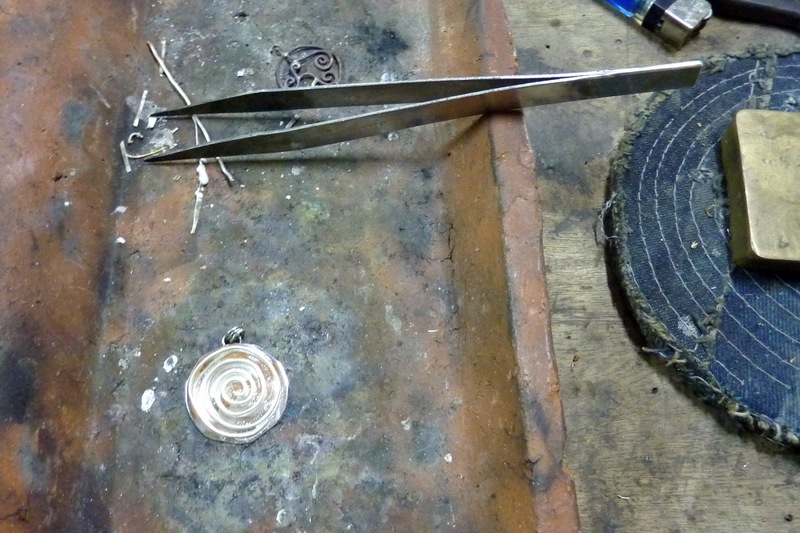 There were just so many tools involved in jewelry-making. I wasn’t likely to master it in a three-hour class. 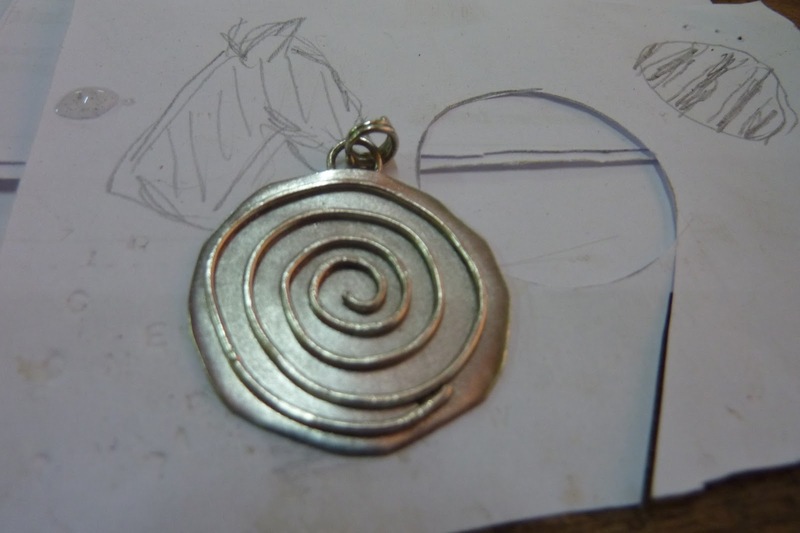 At the end, the shop owner put my pendant on a scale to determine I'd used an extra gram of silver. That was a bit annoying, as I’d had no way of knowing how much was what. But I didn’t want to make a fuss now that I’d just finished and was kind of pleased with my work. I walked back up Jalan Hanoman to Ubud’s main road, where I bought an overpriced mango from a woman who tried to sell me mangoes every day. Her son was Nyoman of my motor-scooter taxi. He offered me a lift back up the hill Penestanan. I protested mildly—I was in a skirt. I eyed his motorbike with skepticism. I knew I could do this—sure, I’d done it plenty of times in 2005 when I’d lived in Uganda. But I’d only had long skirts back then. We zipped me back home with my skirt and new necklace, the wind blowing at me as we sped along. I tugged at my skirt all the way home.